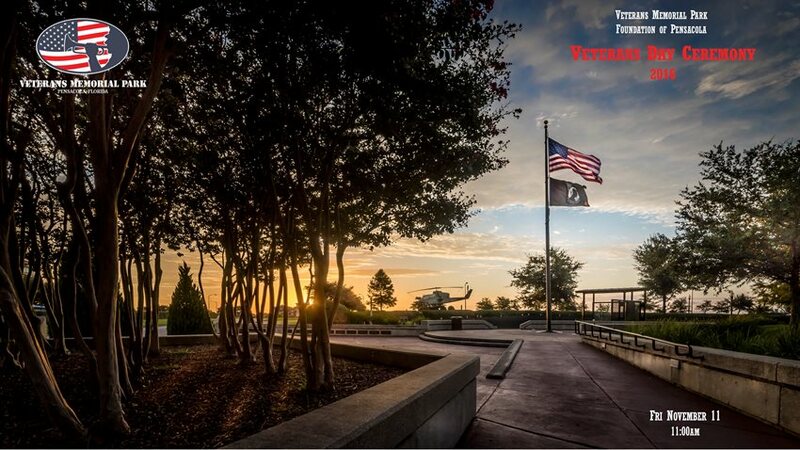 The Veterans Memorial Park of Pensacola stands as a strong testament of sacrifice by our nation’s military Veterans. In recognition of Veterans Day 2016, the Park will be holding a ceremony to pay special tribute to those who have served our nation. On Friday, November 11, at 11:00 AM we will come together to honor our Veterans. The ceremony will feature keynote speaker Colonel Slay Stackhouse, USMC, a presentation of colors, opera singers, and the results of our Veterans Day Essay Contest. Veterans Memorial Park is maintained by Veterans who are passionate about the preservation and reverence for what the Park symbolizes. This park is the only park in the city of Pensacola that does not receive any public funding to help support its expenses. The Park is made possible thanks to the generosity of individual donors. Through the foundation’s unique relationship with the city, Veterans Memorial Park Foundation has complete control over the design, character, and content of the Park, as well as its maintenance and future expansion. Please join our 5-for-5 for Freedom project! A small donation of at least $5 per year for 5 years from each recipient of this letter will provide funding to maintain the Park and its memorials for the foreseeable future. That’s only $5 – the cost of two cups of coffee or one adult beverage per year! Yet it will allow us to continue showing the community and our area’s many visitors the deep respect contributors such as you hold for those whose sacrifices have ensured that our freedom endures. To sign up, please visit our donation page here.